Hillary Chybinski: boys in pink. 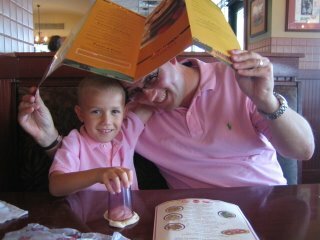 . .
boys in pink. . .
. . .the boys dressed the same today. what you don't see in this picture - are the khaki shorts and teva sandals they are both wearing. how cute are they? gosh i love them to pieces - can't wait to have one more cute boy to photograph.